For a frozen tropical treat, mix up thick and creamy mango smoothies. Stock up on frozen mangos, coconut milk, and pineapple juice, and your kids can make these refreshing treats throughout the summer. 1. Place the frozen mangoes, coconut milk, and pineapple juice in the blender. 2. 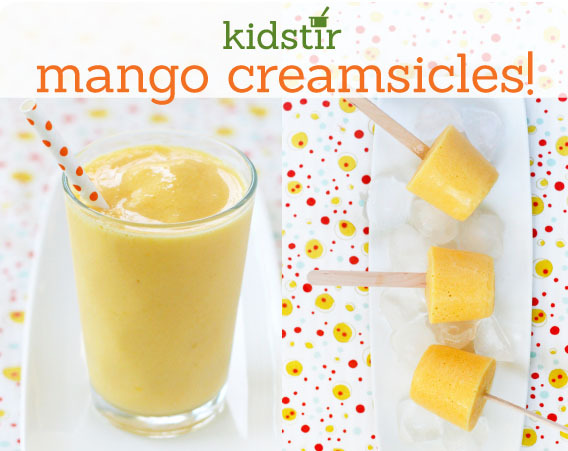 A grown-up can help younger kids blend the creamsicle together until it’s creamy and smooth. 3. Give it a taste test. If you’d like it thinner, you can add extra pineapple juice or coconut milk. Or, if you’d like it sweeter, add a teaspoon or two of honey. Blend again. 4. Pour into glasses and drink right away. Or, pour into pop molds and freeze overnight.